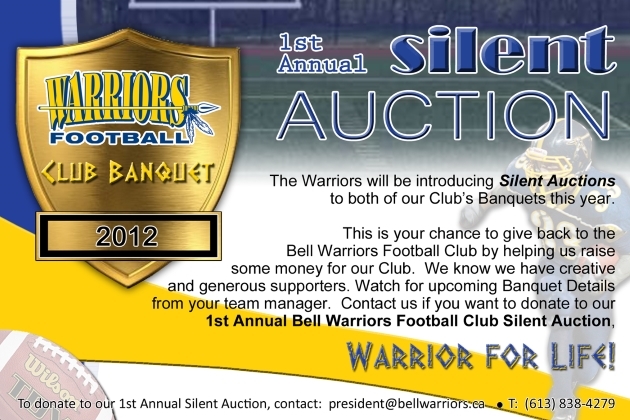 The Bell Warriors Football Club has reached out to local companies and supporters. The response was fantastic Saturday night (January 13/13) at their Team Banquets. Two Club banquets were held. One for the two youngest teams (Tyke ages 8-10 and Mosquito ages 11-12) and one for the Warriors two oldest teams (Pee Wee ages 13-14 and Bantam ages 15-16) and a new feature this year was a Silent Auction that was held at each banquet. In all, the Warriors Club raised $3,200 which will go directly back towards football operations. “Our Club is admired league wide for our commitment to our player’s safety. Being in a position to continually upgrade our equipment and re-condition our existing equipment is a one of our Club’s primary goals. Having said that, we also strive to keep our sport as affordable as possible. It’s a constant challenge to balance. Our Silent Auctions were both received with enthusiasm and will be a feature that we will continue to expand and improve,” says Paul Stewart, Bell Warriors President and Bantam Head Coach. Tyke: Most Valuable Player – Trey O’Brien; Coaches Choice – Max Johnston; Outstanding Offensive Player – Nathaniel Lawlor; Outstanding Defensive Player – Shyreek Phillips; Rookie of the Year – Owen Preston; Most Versatile – Jacob Smith; Most Improved Player – Andrew Decarie; Best O-Line – Thom Dulmage; Best D-Line – Eben Dibula. Mosquito: Most Valuable Player – James Keenan (Stittsville); Coaches Choice – Shayne Forsyth; Outstanding Offensive Player – Josh Streng; Outstanding Defensive Player – Malik Yusuf (Stittsville); Rookie of the Year – Andrew Fullerton (Stittsville); Most Versatile – Kyle Crabtree (Stittsville); Most Improved Player – Kane Obas (Stittsville); Outstanding Offensive Back – Charlie Harris (Ashton); Outstanding Defensive Back – Jake Papalia; ; Best O-Line – Conor England (Stittsville); Best D-Line – Ryan Pacholik. Pee Wee: Most Valuable Player – Dilan Perry; Coaches Award – Andrew Beattie (Richmond); Outstanding Defensive Player – Sheldon Thomas; Outstanding Offensive Player/ Warrior Award – Jack Rabb (Richmond); Rookie of the Year – Josh Howatt (Stittsville); Most Versatile – Brendan Sheahan; Most Improved – Tyler Brown (Ashton); Outstanding Offensive Back – Craig Dawe (Stittsville); Outstanding Defensive Back – Sam Roberts; Best O-Line – Liam Cochrane; Best D-Line – Theo Quattrocchi (Stittsville); Best Linebacker – Brad Cowan (Ashton). Bantam: Most Valuable Player – Mitchell Henselwood (Stittsville); Coaches Choice – Charlie Keenan (Stittsville); Outstanding Offensive Player – Jesse Skucas; Outstanding Defensive Player – Mike Walsh (Stittsville); Rookie of the Year – Kurtis Schaefer (Stittsville); Most Improved – Nick Curran (Stittsville); Most Versatile – Tyler Scott; Best O-Line – Conor Redmond (Stittsville); Best D-Line – Tyrell Haye; Best Defensive Back – Tremayne Rockburn.